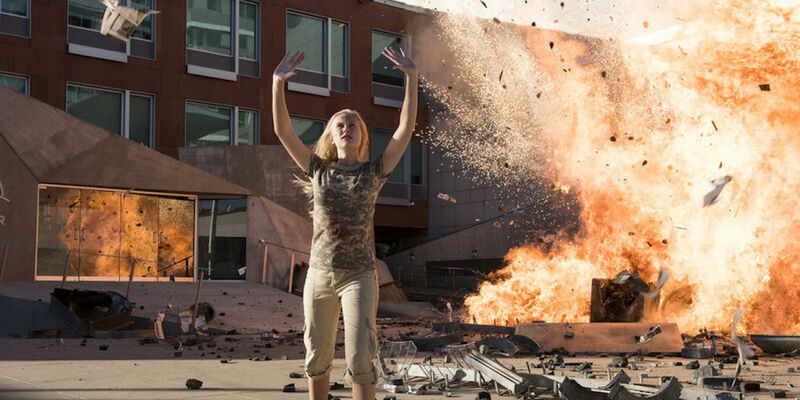 When it was first announced as a miniseries event, fans didn't expect Heroes Reborn to receive a second season order. As a continuation of Tim Kring's Heroes, which ran for four seasons between 2006 and 2010, Heroes Reborn picked up in real-time five years later with Evolved humans known to the world. Though comments from Heroes Reborn star Zachary Levi, who plays the anti-Evo-turned-Evo Luke, seemed to indicate the show wouldn't continue past the 13 episodes first ordered by NBC, the network confirmed a second season wouldn't be happening during this year's Television Critics Association Winter Press Tour. However, you wouldn't know Heroes Reborn was only meant to be one season from its finale episode, 'Project Reborn'. The episode, written by Tim Kring and Zach Craley and directed by Jon Jones, is a culmination of the many heroes' journeys this season to save the world from the solar flares, or Human Extinction Level Event. At the beginning of the episode, Tommy is still trapped in the Evernow prison created by Erica, where he is able to access his past memories and learn to be in two places at once. As a result, when Ren and Katana Girl rescue him, Tommy is able to use Noah in order to save the world from the solar flares along with his sister Malina. In an epilogue sequence, Quentin speaks to government agents about the heroes, saying they're just ordinary people who stepped up when they were needed, while Tommy and Malina receive tarot card messages from their father. 'Project Reborn' is perhaps the most cohesive episode of Heroes Reborn, largely due to the fact that it focuses on a single storyline with one character at the center of it: Tommy. His transformation from reluctant teenager to hero was completed earlier in the season, which leaves him room to use his powers at level where he out-classes even the legendary Hiro Nakamura. Though fans of Heroes will know this was a seemingly impossible feat, it's explained away with a single line of dialogue in which Tommy accuses Erica of giving him all the time in the world to master this ability while trapped in Evernow. Using this power, Tommy goes back in time to help Malina save the world, and stays in the future in order to transport the citizens of Gateway back to the present so they won't be erased when Tommy and Malina alter the timeline. But, Tommy leaves Erica in the future. Through his memories and traveling in time, Tommy learns that he and Malina must use someone as a conduit for their powers in order to save the world, though that person won't survive. Tommy realizes it must be Noah, so he returns to the storm where Noah was almost killed and saves his grandfather, who chooses to help Tommy and Malina. Noah's sacrifice is given the emotional weight earned by being a fan-favorite in Heroes and the entry point for Heroes Reborn. Elsewhere in the episode, the journeys of the other characters come to a conclusion as well. Ren wakes Otomo and the real version of Miko from Erica's machines, and Otomo sends Ren into Evernow so that he can free Tommy. As a result we see his final transformation from video gamer to hero, though he still struggles to leave Katana Girl behind when he's about to complete his mission - a scene that comes off more as a more exasperating than compelling character moment. Luke also receives his final moment of heroism, as he uses his power to take on the first solar flare so that the Earth will still be worth saving once it's Malina and Tommy's turn. Luke's power was never explained either in terms of how it works or how he developed it. As a result, the weight of his decision to sacrifice himself as penance for all the Evos he killed with Joanne gets lost in the technicalities of the scene, which verges on the ridiculous when it sees him flying into the heart of the solar flare and it dispersing. Meanwhile, Quentin has his final confrontation with his sister Phoebe, who is attempting to kill Malina. The confrontation was being built up in previous episodes and it comes to a predictable conclusion: when forced to choose between saving Malina or his sister who he accuses of being coming a monster, he chooses Malina. The epilogue of 'Project Reborn' depicts all the main characters getting back to their normal lives: Ren and Miko are sparring, Carlos is continuing the work of El Vengador with the help of Farah and Jose, while Tommy and Malina return to ordinary teenage life. Quentin gives a voiceover monologue, a typical device employed by both Heroes and Heroes Reborn, as he refuses to give up the identities of those who saved the world to a pair of government agents. He talks about the heroes as everyday people - "they couldn't be more ordinary" - and insists they just want to be left alone in their lives. This epilogue would have served as a sufficient conclusion to Heroes Reborn, and the entire Heroes franchise on television, returning the Evos to normal life among humans. But, the tarot card messages to Tommy and Malina, along with Angela Petrelli's message that the cards mean their father is coming for them and no one will be able to protect them, is a cliffhanger. Either the creatives behind Heroes Reborn were hoping to receive a second season or they chose to end the entire story on a cliffhanger, but either way it's not as effective a conclusion as the s how deserves. On the whole, Heroes Reborn had trouble drawing in viewers - whether new to the series or returning from Heroes - in today’s TV climate. In the current state of television where superhero stories can be seen in a variety of iterations across multiple networks or streaming services, Heroes Reborn felt too stuck in the past even from the very first episode. Sure, Heroes was groundbreaking drama following super-powered individuals when it first premiered, but superhero television has evolved and Heroes Reborn inevitably failed to evolve along with it.